Definition at line 51 of file llassoclist.h. Definition at line 75 of file llassoclist.h. Definition at line 81 of file llassoclist.h. Definition at line 147 of file llassoclist.h. Definition at line 156 of file llassoclist.h. Definition at line 241 of file llassoclist.h. Definition at line 255 of file llassoclist.h. Definition at line 211 of file llassoclist.h. Referenced by LLCharacter::getAnimationData(), LLPolyMesh::getMesh(), and LLCharacter::setAnimationData(). Definition at line 225 of file llassoclist.h. Referenced by LLPolyMesh::dumpDiagInfo(), and LLPolyMesh::freeAllMeshes(). Definition at line 87 of file llassoclist.h. Definition at line 93 of file llassoclist.h. Definition at line 278 of file llassoclist.h. Definition at line 271 of file llassoclist.h. Definition at line 106 of file llassoclist.h. Definition at line 135 of file llassoclist.h. Referenced by LLPolyMesh::freeAllMeshes(), and LLAssocList< std::string, LLLinkedList< ParameterizedMotion > * >::~LLAssocList(). Definition at line 181 of file llassoclist.h. Definition at line 198 of file llassoclist.h. Definition at line 284 of file llassoclist.h. Definition at line 71 of file llassoclist.h. 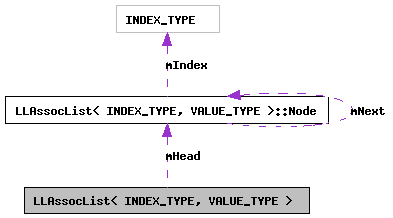 Referenced by LLAssocList< std::string, LLLinkedList< ParameterizedMotion > * >::isEmpty(), LLAssocList< std::string, LLLinkedList< ParameterizedMotion > * >::length(), LLAssocList< std::string, LLLinkedList< ParameterizedMotion > * >::LLAssocList(), and LLAssocList< std::string, LLLinkedList< ParameterizedMotion > * >::remove().